G-Wizard Thread Calculator is a premium add-on module for G-Wizard Calculator. 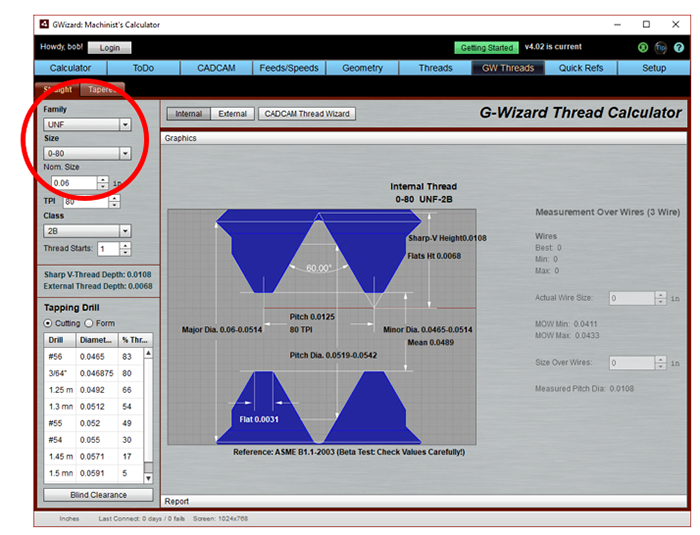 You must have a working version of G-Wizard Calculator to use G-Wizard Thread Calculator. 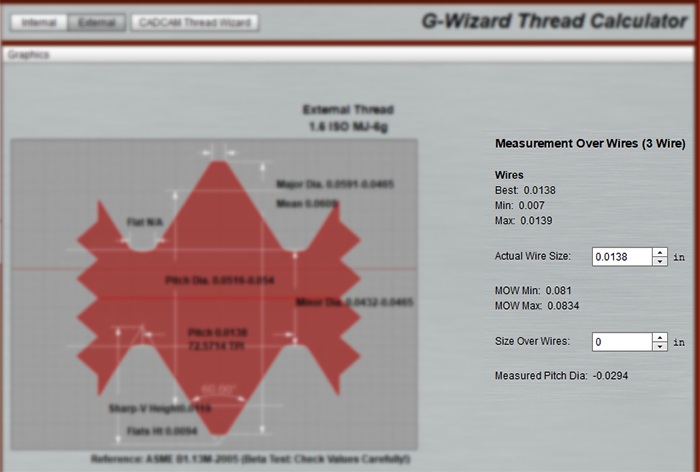 Note: G-Wizard Thread Calculator is currently in Beta Test and is therefore not officially released for production use. report any problems or feedback to bob@cnccookbook.com. What is a Thread Calculator? Determine Thread Dimensions such as Major Diameter, Minor Diameter, Pitch Diameter, and dozens of other variables that specify a thread. How to check those dimensions, for example use the “Measure Over Wires” technique or what the dimensions should be if you want to make Go/No Go Gages. Tell you what the tolerances are to keep your threads within spec. Calculate all of this for standard and non-standard sizes. Tell you what tap drills to use for tapping internal threads. Print detailed reports to be used for inspection, quality control, and documentation. Handle the largest possible variety of thread types. 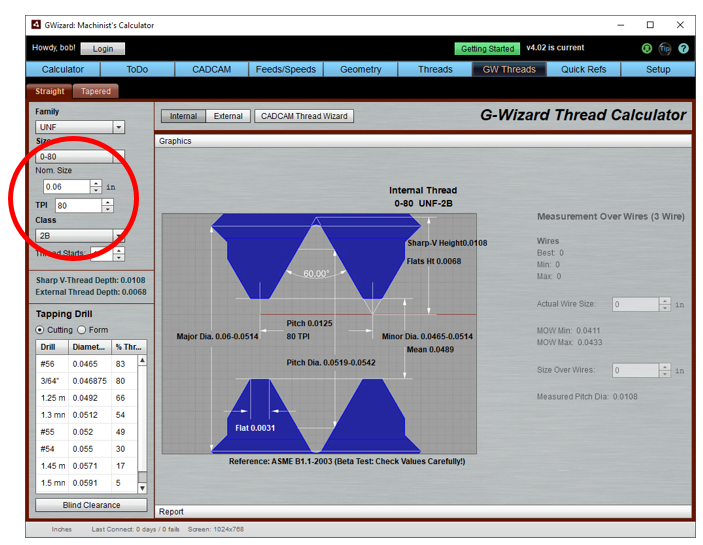 G-Wizard Thread Calculator can do all this and more. If there is no GW Threads tab, it means you’re not registered to use GW Thread Calculator. Go to the product page and register for a free trial or purchase. 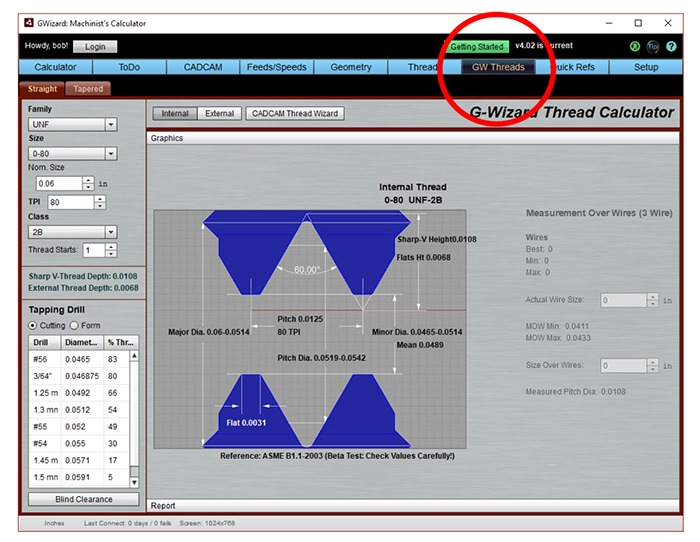 GW Thread Calculator divides threads into Straight and Tapered (Pipe threads are often tapered) groups. Select the tab at top for the one you want. Not all families allows custom thread sizes, but many do. You’ll need to enter a Nominal Size (also known as the Basic Major Diameter) and either TPI (Threads Per Inch) or Pitch (many metric Families use pitch) for your custom size. GW Thread Calculator will then calculate all the dimensions for the thread. Not all thread families have tolerance classes, but when they do, you’ll set them here from the “Class” dropdown. Change the number of starts from the default of “1” to create a multi-start thread. Determine the optimal size for your tapping drill based on whether you have a cutting or forming (thread rolling) tap and on what percentage threads you want to create. Be sure to check out our in-depth article to understand the effect of thread percentages on tap life. Graphics View gives you a quick visual summary of the thread. Report View has a lot more information and is intended when you want to print a report with as much information as possible about a particular thread. 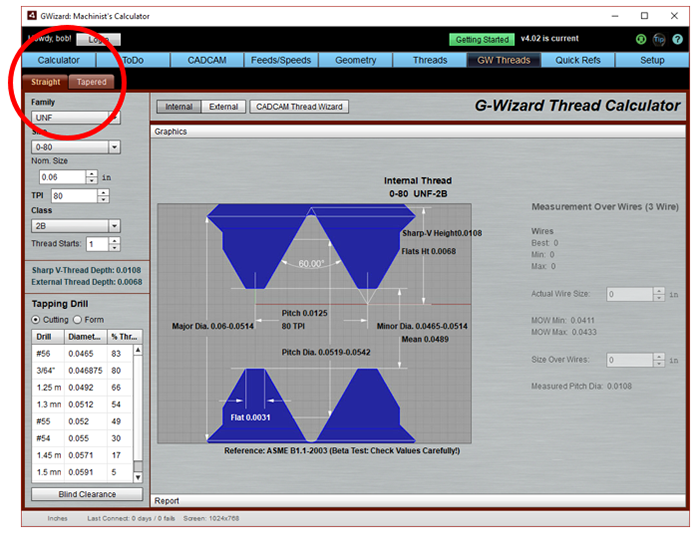 Click this button to load the currently selected thread into CADCAM Wizards. At the top of the MOW Calculator are the Min, Max, and Recommended Best Size to use for measuring wires. Enter your actual wire size, and the MOW Min and Max for the thread to be in spec are given. Enter the Size Over Wires you measure and the pitch diameter of the thread will be given.